If you're looking for romance, mystery, and summer vaca fun all rolled into one then look no further! I'm pleased to be part of a summer anthology featuring 22 awesome mystery and romance authors. 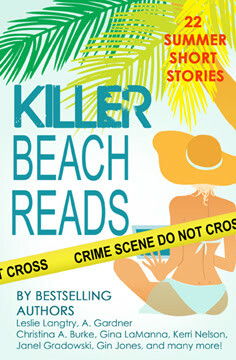 KILLER BEACH READS includes the Poppy Peters prequel, Ice Cream Bombes & Stolen Thongs. What is an ice cream bombe, you ask? It's basically a dome-shaped layered ice cream cake that you freeze in a large mixing, and flip upside-down to serve. My short story includes a recipe for my brownie ice cream bombe. And yes, I've already made it once (or twice) this summer. Bon appetit & happy reading! 22 summer themed short stories by bestselling mystery and romance authors! Enjoy mystery, romance, and lots of laughter under the sun with shorts from some of your favorite series. The perfect quick reads for vacation lounging or sipping frosty drinks poolside!